Although the terms of the Treaty of Versailles severely restricted the equipment of the German army a great deal was done after the war to plan and prepare for a future rearmament, and the loss of most of their equipment gave the Germans a clean slate from which to start. 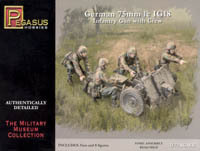 One perceived need was a light field gun for infantry support, and the result of that was the development of the 75mm le IG 18 ('leichtes Infanteriegeschütz 18' or 'light infantry gun'). A prototype was made in 1927 and the gun was officially brought into service in 1932, serving through to 1945, during which time thousands were made and used. The gun was basic but reliable and well liked by the troops, and was still being manufactured in the last months of the war. To consider the gun first, our first thought when we looked at the gun sprue was it had a lot of very small parts. This is no 'easy-build' model to be put together in a couple of minutes, but one that takes detail very seriously. We do not claim any great expertise in such artillery, nor in other model kits of the le IG 18, but this one looks very good and very highly detailed, while comparison with various photographs suggests it is perfectly accurate. The gun is made in a hard plastic that takes glue well (the best material for such kits in our view), and comes with a choice of spoked wooden wheels or solid steel ones with pneumatic tyres. The former was found on earlier production, while the latter, more suitable for motorised towing, indicates later manufacture and is the choice we made for the model photographed above. This gun generally had a crew of six, but clearly not all crew could be next to the weapon so Pegasus have provided two crews of four. The first crew, pictured in the top row, is for the Waffen-SS, while the second row shows the ordinary Wehrmacht crew. The army crew wear standard German uniform of tunic and boots plus all the usual personal equipment and are perfectly authentic, with some separate rifles being provided for laying aside or perhaps even slinging on the body. The Waffen-SS crew are wearing smocks - a normal item for such troops throughout the war - and camouflage covers on their helmets. Instead of high boots they have ankle boots and short gaiters, more appropriate for the later war. They too are entirely accurate in appearance. While the poses differ all are very good with a very real sense that the men are actually using the weapon. So many artillery figures seem to have no real interaction with their weapon, but these do thanks to the separate arms that many have, which greatly improve the poses. The sculpting is excellent, with all the detail you could ask for and some very realistic poses. The complete lack of any flash or unwanted plastic is always welcome, although as can be seen from the sprue for the men there is some assembly required which needs glue. It should be noted that none of the figures have a base, and many do not stand by themselves. Instead they have a peg which could be used to fix to a base (not supplied), which we feel is a bit mean as it would have taken very little effort to supply eight separate bases. Unlike the gun the figures are made in a softer plastic, which means the set makes the best use of different materials for different components. A number of extra rifles, shells and ammunition boxes (not pictured above) help complete the scene nicely. This looks like a great kit, and the provision of a choice of crewmen adds a lot to the value. The kit may not be the easiest ever produced but the result is a highly detailed model. It takes time to make up both gun and men, but this effort is rewarded with some fine pieces that should delight those needing front-line support for their miniature German forces.